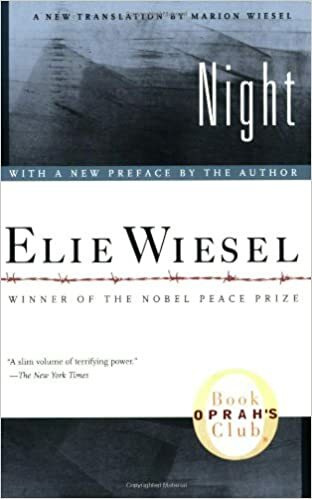 Night is a memoir of Mr. Wiesel's life as a young man imprisoned during the holocaust. Such a great book that left an everlasting impression on my heart, just as I knew it would. Night starts out giving you the feeling of community that he came from then takes you on to the suffering that he and his family endured. At times it became a very hard read for me as the unimaginable sadness and terror hit me right in the face. I gave myself a break at those times till I could calm down and pick it up again. I was so impressed with Elie and his loyalty to his family. He was a strong, reliable young man and loved God. At times he dealt with questions about where God could be and why he lets things happen. We all would feel the same. So sad so many turned the backs on what was happening in their backyard. It wasn't happening to them so they just ignored it. I can see where history could repeat itself if we let it. So glad he told his story so that we should never forget. This was one of the books I read for our Library's summer reading program.